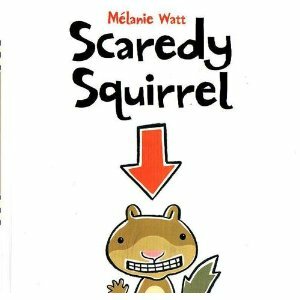 We read Scaredy Squirrel (CAN, JP, US), written and illustrated by Mélanie Watt and published by Kids Can Press (2008). Scaredy is a squirrel who loves to play the "what if?" game. Scaredy thinks of scary things whatever the situation and therefore sticks in his tree and never ventures out into the world. Until one day when he is forced out! But with the help of an emergency kit and playing dead he is able to confront his fears about the world and change up his day to include exploration of the wider world. This is one of those books that parents of Free Range Kids love, I'm sure. Scaredy and his giant smile are adorable. It's no wonder then that he is the star of his own cartoon tv show, or that he has his own iOS app. I've never seen the tv show, but we have the Scaredy SOS iPhone app and it is a hit with the kids. In the world of Canadian kids publishing, Scaredy Squirrel, Caillou, and Franklin the Turtle are all big names, and all a bit wimpy. I wonder if there is a reason for this or just coincidence! This is the 22nd book I read for the 5th Canadian Book Challenge. Funny, I don't think of Canadians as wimpy, but I'm in Alaska, and I am most familiar with northwestern Canadians. They may build them tougher and braver out here! I like Scaredy Squirrel but haven't seen the TV show or app yet. I'm also a Franklin fan. That's my image of Canadian kids too, but I haven't lived in Canada for a long time! I'm also a Franklin fan, but don't necessarily consider him "wimpy," just careful. I don't mean anything bad by this at all! The wimpiest I ever met was me! It just surprises me that these books are all aimed at kids like me when my recent experience with Canadian kids is my son and nephew who are not cautious about anything! I wish they were, it would save on emergency bills. Huuum. I'm American, but have seen the stuff you are talking about minus this squirrel. I'm not sure I would say wimpy. Just maybe careful and gentle. Characters in American cartoons especially tend to be a little too nuts and over the top sometimes I think. The Scaredy Squirrel cartoon is a bit different than the books - it moves fast and the characters are a bit over the top. I prefer the books by far.